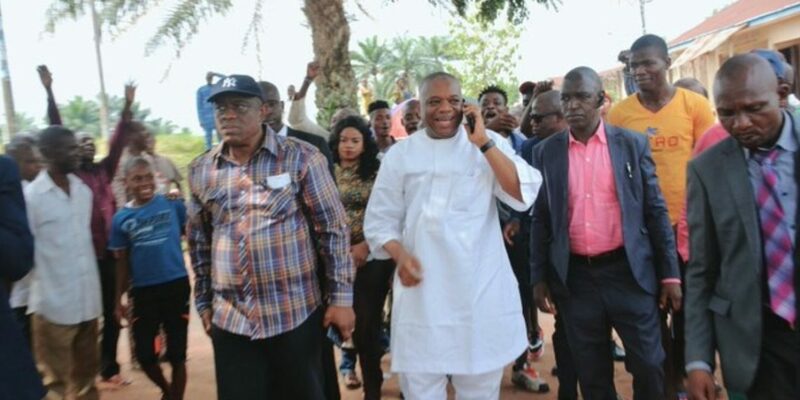 Former governor of Abia State and senator-elect, Dr. Orji Uzor Kalu, has declared his intention to contest the post of Deputy Senate President. Speaking with aviation reporters early on Wednesday at the Murtala Muhammed International Airport, Lagos, on his way to Brussels, Belgium, Kalu said he opted for the Deputy Senate President position as a mark of respect for the decision of the ruling All Progressives Congress (APC) to zone the Senate Presidency to the North East. How prepared are you to get the party allow you vie for the Senate President when we learnt it’s not been zones to the South East? Well, I am a very loyal party member. The party has zoned the Senate President to the North East and I am bound to respect the party’s will. Therefore, the second position, which is the Deputy-Senate President, is what we are not going to allow the party to decide. Therefore, I am going to run for the Deputy Senate President. As far as I am concerned, I am going to run openly on the floor of the House for the Deputy Senate President. I am not going to listen to the party, neither will I listen to anybody. Nobody going to be the Deputy Senate President is more loyal than I am to the party. I have suffered for the party, and I want the party to respect the will of every other person and the fact that I am committed to democracy. So, as far as my desire is concerned, we are going to be seeing votes on the floor of the Senate for that position. Section 50 of the Constitution has made it very clear that members of the National Assembly shall elect their leadership and I am going to rely on that section of the constitution to vie for that position. I learnt that they have ceded the Deputy Senate President to the North West, but it is not right to do anything of such. We are going to contest this position vehemently on the floor of the House. I have the backing of my colleagues. So, whether they have already given it to an individual, that is left for the party at the National Assembly to decide. But for the Deputy Senate President, I will contest with any candidate on the floor of the House. Have you communicated your intentions to the party? The patty is supreme. I know that our Chairman, Comrade Adams Oshiomhole, is a listening chairman and President Muhammadu Buhari is a man of justice. So, for justice to prevail, the right thing should be done. You cede the Senate President to the North East and Deputy Senate President to the South East and that’s very fair. And am sure you know that the APC chairman is from the South-South; the President of Nigeria is from the North West; the Vice President is from South West, and they have decided that the President of the Senate will come from the North East; whether it’s Lawal or Ndume, the senators will decide that one on the floor of the Senate. For me, Nigeria is like a tripod, comprising Igbo, Yoruba and Hausa. So, it will be unfair not to have a South East in that tripod; that is why we are going to get the Deputy Senate President. I will fight for it on the floor of the Senate as no other person has fought. This is not like challenging the party, rather, it is a quest for equity and justice. President Buhari said he will be addressing issues of injustice in the country. This is part of the issues of injustice. You cannot tell us in the South East to go and be Chief Whip. I don’t have a whip to whip anybody. You don’t build loyalty in a section of people or individuals. I am loyal to the people, I am loyal to Nigeria, which is important? But I am not going to be loyal to individuals. “I am a Catholic and I believe there is a need for peaceful co-existence between the different ethnic and religious people. So, when I say I want to be Deputy Senate President, I don’t imply that I want to be a Senate deputy president for some people. I am not going to be Deputy Senate President for anybody. Otherwise, if they don’t listen to my plea, I will also join others and contest for the Senate President on the floor of the Senate. I will join the race because I already know that it is going to be like a shopping matter. I can shop like any other person that is being put there. I have the capacity and capability to shop because the whole thing will be like shopping on the floor of the House. If the party continues this way, I will run for the Senate President position then. Are you really disturbed about positions of principal officers given to the South East? Positions are part of representations for the people. What I am saying is that if we have the DSP given to the South East, it gives a sense of belonging to everybody in Nigeria. But, I am not saying I am representing a section of people in Nigeria. Now consider this: If the present administration goes to a meeting to discuss Nigeria, you will have the President, Vice President, Senate President and Deputy Senate President; in all of this you don’t have anybody to represent the South East, then that is unfair and that is what I am saying here. I am not a tribalist; I’m someone who is fair and want fairness. I want justice. So, if the party doesn’t want a crack, they should zone the positions properly to the geopolitical zones of the country. No one should be left out. A zone that has taken the presidency is not supposed to take the Deputy Senate President as well. But rest assured that we are not going to quarrel; we will sort it out. I have over 56 senators on my radar who have already signed for me for either Senate President or Deputy Senate President. And these are people who believe in equity. I have been in the legislature before, so I have the experience. I have been a two-term governor and that comes with a whole lot of experience. Senate Godswill Akpabio became minority leader as a first-term candidate. So, it’s not a question of, oh I’m going there for the first time. Are you not worried about the winner-takes-all statement of APC Chairman, Adams Oshiomhole? That is the opinion of the chairman and the inner party caucus. It is only when we get to the floor of the House that we know who is who in the system because in a presidential system of government, there is room for lobbying and I am going to lobby. I am not contradicting Adams, he’s my very close friend. I am only saying we must be able to exercise give and take. But Nkeiruka Onyejeocha from the South East is also vying for Speaker of the House of Reps? Yes, it is her constitutional right to vie for that position. Nobody should stop her. It’s her constitutional right. The economy seems not to be doing very well, are you not disturbed by collapsing business? I am a private-sector person. You can say I have succeeded in politics, just like I have succeeded in business. I want to assure you that my mission to the Senate will involve bringing stakeholders on board and they will be talking about how to make new laws that will be favourable to business and the business community and I will lobby the president to sign it. The downturn in the economy is not only affecting Nigeria but everyone. So, I am going to do everything with my powers to ensure that the economy grows. I have the capacity to lobby and to move around to make the economy work. But it will take the collective decision of Nigerians to once again get the economy back on track.